Tis the season of giving and since if you're here you probably love books, I thought I would give one lucky person today the opportunity to win a book. Back in November I had a chance to attend the Virginia stop on the Futures & Fairy Tales tour, where I saw Sarah Fine (author of Of Metal and Wishes), Cristin Terrill (author of All Our Yesterdays), Lindsay Smith (author of Sekret), and Claire LeGrand (author of Winterspell). Hearing everyone speak was great, and I decided to get a copy of Winterspell because I love all things Christmas and the hardcovers are stunning (otherwise, I am trying not to buy hardcovers unless I have already read the book or it's part of a series). If you have no idea why Winterspell is Christmas-y and what it's about, here's a little more info. Sounds like a book you want in your life, right? Well the good news is that one lucky winner will receive a copy of Winterspell! If you're interested, check out the rules below and fill out the Rafflecopter form to win. 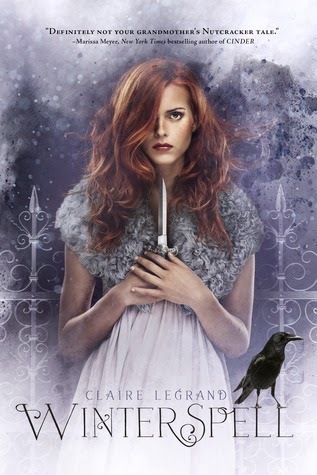 *One winner will receive a signed copy of Winterspell by Claire LeGrand. *You must be thirteen years of age to enter. *The giveaway will end on December 29th at 11:59 p.m. I absolutely LOVE everything about Christmas, and ballet is something I also adore. I can't wait to read Winterspell and Summerfall! Also Claire Legrand is a sweetheart! Nutcracker retelling! Need I say more? I actually used to be a ballerina until my dance teacher bullied me and I quit. But I always wanted to dance Clara's part. I used to loooove watching the Nutcracker movie (the animated one) when I was a kid, and I'm so intrigued by Claire's darker retelling. It sounds fantastic! When I was a little a trip to see the local production of THE NUTCRACKER was the tradition that kicked off the holiday season for me so when I heard this was inspired by it I immediately wishlisted it. I enjoyed her other books, and this one sounds great! I've heard how unique this book is and I love trying out different things! Super excited to get to read this one and they just announced that she's going to be at NTTBF in March! SO EXCITED! I absolutely love the Nutcracker, and I also love books with a bit of darkness to them. This is one of my most anticipated reads of this year! Thanks so much for the generous giveaway! I've been watching a lot of Arrow lately, and previously, I loved Chuck and Alias, so stories about living double lives are apparently some of my favorites. I also love historical fiction, so a novel like Winterspell that combines a setting of the late 1800s with a secret life is one I HAVE to pick up! This looks like a lovely christmas read. Retellings and late 1800s setting? Sounds awesome!I Plus, the cover is absolutely stunning. I'm really looking forward to reading this one. I love adaptations, and one based on The Nutcracker sounds amazing. As for holiday reads, my favorites are The Polar Express and Dash & Lily's Book of Dares. My True Love Gave to Me is said to be really good, too. I have been all about retellings lately, especially with a reread of The Lunar Chronicles in progress! Anxious to get my hands on this one. I love retellings and I've seriously been dying to own a copy of Winterspell. I hope I get the chance. Thank you so much!